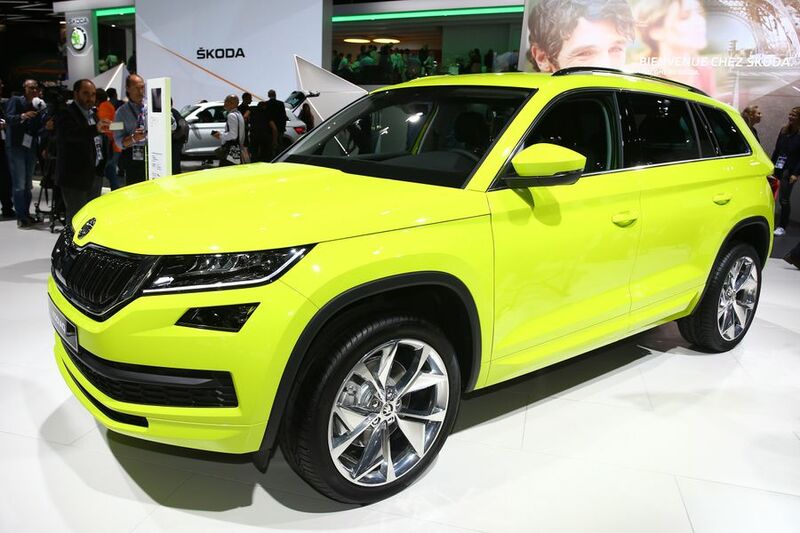 The new Skoda Kodiaq has made its debut at the Paris Motor Show. A large SUV with up to seven seats, it’s the first such vehicle to be sold by the company, and will reach dealerships early next year. At 4.7-metres long, the Kodiaq is almost exactly the same size as the Hyundai Santa Fe and Kia Sorento, which will be two of its biggest rivals. The rear seats are 60/40 split and can be folded down, as well as moved backwards and forwards by up to 18cm, and the angle of the backrest can be individually adjusted. 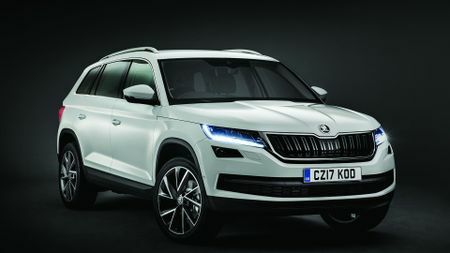 Then, for the first time in a Skoda, there is a third row of seats, making the Kodiaq a seven-seater. 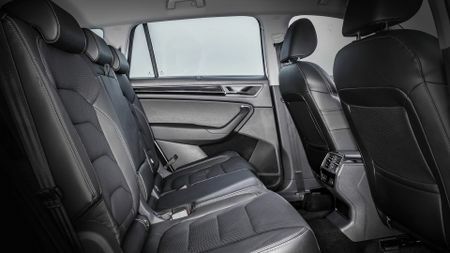 In five-seat mode, the boot capacity is 720 litres, but that rises to a class-leading 2065 if you fold down all the seats; and, with the optional fold-down front passenger seat, the car can carry items up to 2.8-metres long. In keeping with the company’s ‘Simply Clever’ slogan, the car also has several neat features, including door-edge protection. When a door is opened, protectors pop out automatically to prevent the metal edge of the door hitting anything. When the door is closed, they fold back in. 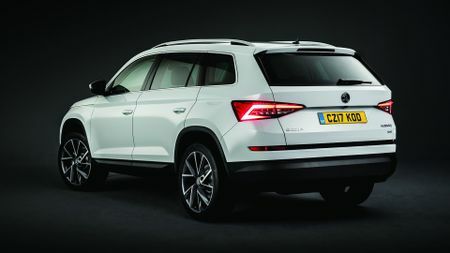 The Kodiaq will also be available with a host of safety-related and driver-assistance systems, some of which are new to Skoda, although many have already been seen in other cars from the Volkswagen Group. These include Trailer Assist (which can automatically steer the car when towing at low speeds), surround-view cameras, City Emergency Brake (which works at speeds of up to 21mph) and Adaptive Cruise Control, as well as Lane Assist and Blind Spot Assist. Also available will be the latest in connectivity and technology, with all models coming with a 6.5-inch screen. As an option, this can be upgraded to an 8.0-inch touch-screen, and buyers can also specify things such as sat-nav, Apple CarPlay and Android Auto. In all, three trim levels and five engines – two diesel, three petrol, all with stop-start systems – will be available. 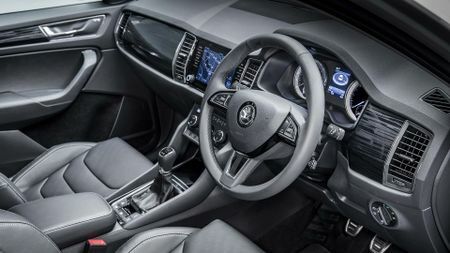 Full specifications are yet to be revealed, but Skoda has said the less powerful of the two 2.0-litre diesel engines will average 56.5mpg and emit 131g/km of CO2; and, the entry-level 1.4-litre petrol engine has vital statistics of 47.1mpg and 140g/km. The most powerful petrol and diesel engines come only with a seven-speed semi-automatic transmission and four-wheel drive, but most of the engines can be paired with either two- or four-wheel drive. Among the options will be Driving Mode Select, which allows drivers to choose between Normal, Eco, Sport and Individual modes, which adjust the operation of things like the engine, automatic gearbox, power steering and air conditioning. In four-wheel drive models, this can be combined with an off-road mode, which tailors the way the engine, brakes and chassis behave to use away from Tarmac. There’s no word yet on how much the Kodiaq will cost, but we expect the car will be cheaper than its main rivals, suggesting a starting price of less than £25,000.